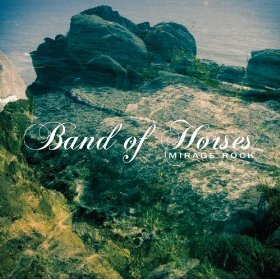 There’s an inviting, laid back feel on the new Band of Horses album, Mirage Rock, and the music comes off more like a down-home fireside jam than a traditional album. The 11 new tracks feature an enhanced country music sound and while there’s no stand-out, must-hear songs, the experience of listening to the album in itself is the highlight. The album begins with “Knock Knock,” one of the more rock-oriented songs. But it’s songs like “How To Live,” with its interesting vocal and musical melodies, and the upbeat “Electric Music,” which give a better glimpse at the mellow, AM rock vibe, which functions as the connective tissue between a majority of the tracks. The singing is upfront and often beautifully harmonized in songs like “Slow Cruel Hands Of Time” and while they may have never lived in the desert with a horse with no name, you wouldn’t know it if you heard “Dumpster World” because it sounds like an unreleased America track that turns it up at the halfway point then fades back into the lonely desert. The album ends on an odd, but interesting note with “Heartbreak On the 101,” which has a Tom Waits type voice-over and is as much prose as a song, but beautiful either way. loving their new album “mirage rock”. check out more live videos on their website!